Members and staff of the Alabama Million Dollar Band woke up this morning looking forward to marching on the biggest stage of the season, the College Football Playoff National Championship, but instead they woke up to the news that Stephanie Cartagena a member of the color guard section had passed away after a year long battle with a brain tumor. Tonight the Georgia Redcoat Band and the Alabama Million Dollar Band will wear grey ribbons on their uniforms to honor her at the game. For more information on their performances and to maybe catch a glimpse of the ribbons click here. Last December we reported to you that after a week of suffering from migraines and vomiting, she was diagnosed with the brain tumor and immediately underwent a 10 hour surgery followed by a second that same week. She felt well enough to visit the band at the Peach Bowl and traveled with the band to the National Championship last season. 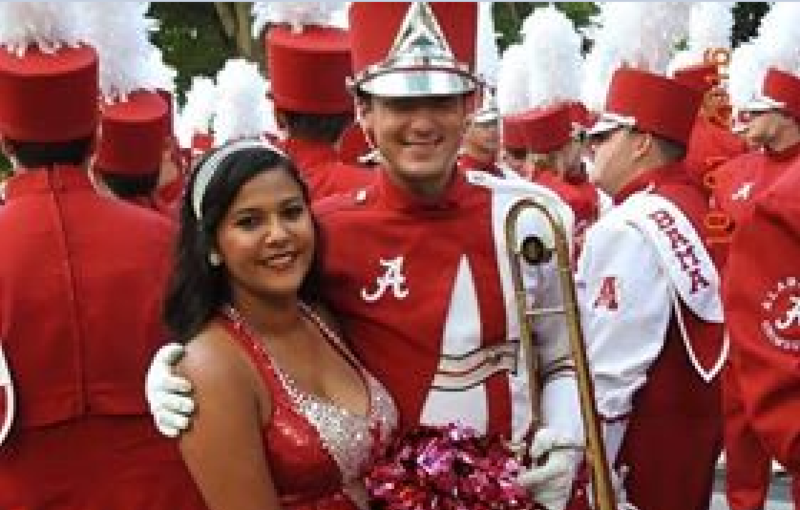 During the spring semester she participated in Alabama's Winter Guard, Alta Marea, while also going through chemo and radiation therapy, but had to have a third surgery in May of 2017. She was cleared for band camp this past summer and joined the Million Dollar Band for as much as she could. She worked out with the guard and would run laps around the field while the rest of the line would drill choreography in order to rebuild her stamina. She was awarded the "Chirs Hainsey: Ultimate Team Player" award by the Million Dollar Band which is an award given to a member who is driven to push themselves beyond what is expected for the love of the activity and team. Stephanie ended up spending most of the semester at home and around Thanksgiving another tumor was found. Surgery was no longer an option. Sadly, she passed away this morning surrounded by her family. If you would like to remember Stephanie and honor her we ask that you help the family and make a donation on her gofundme page as they try to pick themselves up and pay off her medical bills. You can donate HERE.